How spiritual beings travel through social media, is a piece of wisdom you must understand. For this will steer your journey in life towards the correct direction. There is no distance that spiritual beings cannot reach. The key of discernment is in your conscious awareness to be able to see light from dark. We are in an age of technology with communication able to reach across the world in fast speeds. The age of social media is here and with the big social media giants allowing for people to connect is a great thing for both personal and business life. For so many problems can be solved with this new technological reformation. Now just as in social media you decide who you want to add as friend, pin a post, retweet a tweet etc…. You also have the ability to discern when a spiritual being is trying to communicate with you. As such it is of utmost importance to know your essence, soul, and purpose in life. For this lays the foundation for you to hold steady as you go along your journey. So you may be asking yourself how spiritual beings travel through social media?. Quite simply via the same way a person will add you as a friend, pin your post, retweet your tweet, share your photo. With the speed of communication you can get this message extremely fast as you have push button notification on your cell phone or tablet. You may be in a business situation and a warning message may come from a loved one who has passed, one of the arch angels, or Jesus. The spiritual beings travel through human beings and get them to send a message to you via social media. The human being is not aware of your situation, however the spiritual being has chosen them in this instance as the name of the human, or the message they send, or the retweet they post or image they ping has the message you need to alerted to. This message very often comes within seconds of having communicated with someone in your business situation. As such these amazing spiritual beings are nurturing you to guide and help you select the correct path along your journey. This is profound esoteric wisdom to raise to your conscious level as it gives the need to act urgently. It allows for you to stay true on your path and not fall to distractions. There has never been a better time in history for the average person to connect with spiritual beings in this age of technology. For the gifted people who hear, feel or see the spiritual realm they have this gift often given from when they are born, others harness the skill to seek these traits. Imagine now the everyday person can tap into this gift by way of interpreting the messages given via social media as a push notification on their smart phone and tablet. You can begin to reach the higher plane and make a difference in this world. 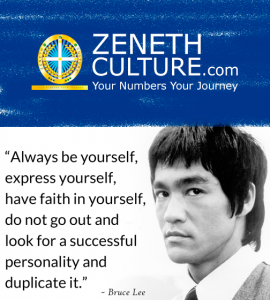 The esoteric wisdom of numerology and astrology which is the highest of highest knowledge is an art form. In my search for the holy grail so to speak and having cross referenced with many different pearls of wisdom from across all four corners of the earth. 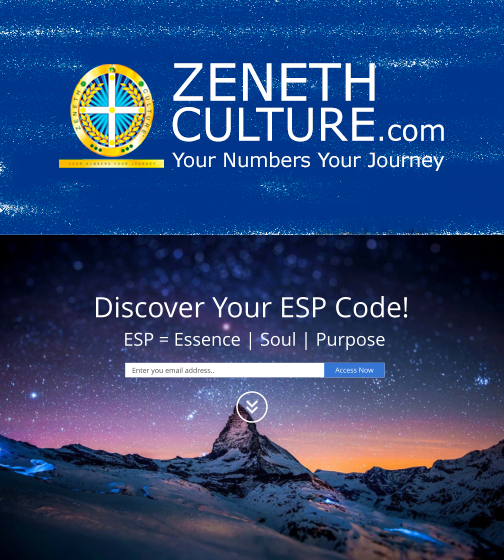 I have merged these amazing pearls of wisdom into The ESP Code (ESP = Essence/Soul/Purpose). This will soon become an app that will reform the way people live their business and personal life. It is wisdom that is fast and accurate and will allow you to solve many problems fast, and swaying from your path. 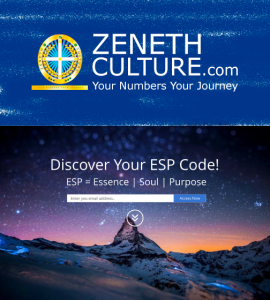 For indeed it is time to understand your esp codes and the allow for your numbers your journey to come to fruition. You have a gift that needs to be nurtured. In this age of technology you can live your passion and monetize it. This will allow for you to be happy and share your gift to the world and be of service. I stress to you though, follow the path of light and not dark. Do not fall trap to other people’s insecurities, fears, jealousy for their path and karma will come back to them, often in forms of sickness as a warning sign. Remember we all have free will. The power of knowing your essence in life and dropping your ego is the path towards ascension. Seek people who truly honour your essence, soul and purpose in life and allow for the energies between you to blossom. Enjoy the conscious awareness of how spiritual beings travel through social media.